Well, almost everybody. 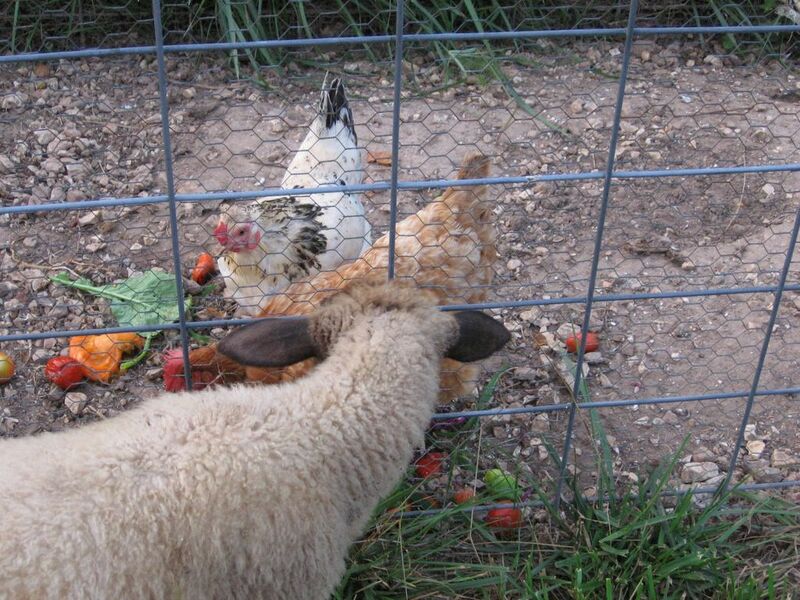 About half of the sheep absolutely love tomatoes. These are the ones who will greedily slurp up bucketfuls of juice and seeds and skins leftover from canning or freezing and then gaze up at you with a big, wet, drippy red smile. The other half of the flock can't figure out what the big deal is. Now while Cary has sampled (and acquired a taste for) practically everything else in the garden, she has yet to bite into one of the many ripe tomatoes weighing down the vines. And since I don't know if she's a tomato liker or disliker, I'm certainly not going to find out by giving her one. The day Cary decides she likes tomatoes is the last day she enjoys her garden privileges (and they already aren't nearly as lax as they used to be). New to your blog, and it is great. I love the photos and I really liked the big red smile...I'd love to see a photo of that. How funny that some of the sheep liked the tomatoes and others didn't. I wanted you to know I made your Blueberry Breakfast Bars this morning - I didn't have enough blueberries, though, and added some cranberries. Wow. Great recipe. We're going to have some for dessert now, too. I posted about them and linked back to you. I'm new to your blog. I love tomatoes and was always told by my papaw that Jet Star Tomatoes were the best....come visit me sometime. Hmmm...'Jet Star' tomatoes? I'll have to try those next year. Great post as always, FG! My hen (Myrtle Mae) is getting many of my fungus-riddled and cracked tomatoes. She loves 'Better Boy' and 'Rutgers' tomatoes. I'm just extremely disappointed at how the hot, dry weather has made my dream of Tomato Glory an impossibility this year. I'll try your suggestion from your e-mail and grow many more varieties next year to ensure that something will grow. Great blog! Keep up the awesome work! Growing tomatoes here on the Island, for the first time, has been a challenge. The cherry ones are ripening the larger ones are still green. I have hinted to my honey that a green house would be really, really nice as I could have tomatoes so much earlier in the season.I think a few more comments along the lines of " gee I don't think these tomatoes are going to ripen before the cold weather gets here" may prod him into doing something about a greenhouse for next season. Way too much focus on the tomatoes and that wooly thing sticking her nose in our business, and not enough focus on us chickenz, people! Hmmm. Multiple chickenz posting here. Very interesting. We all seem to be on the same page, however. i take this to mean that the massive pruning that you did of your tomatoes plants did not reduce their yield? Welcome to the farm! Thanks for taking the time to write and say hello. I will definitely see if I can capture a photo of a smiling, tomato-faced sheep. They really look hysterical--and so happy. I was surprised the first time I fed tomatoes to the sheep and some of them snubbed their noses. Cranberries and blueberries sound like a great combination. So glad you enjoyed the recipe--thanks for letting me now (and for the links). Welcome to the farm! Hmmm, I've never heard of Jet Star Tomatoes. Will have to investigate. Yes, definitely grow lots of different varieties of tomatoes. Way more than you think you should, in fact. You never know what is going to happen with the weather, insects, etc. For instance, I almost always can rely on a super crop of San Marzano paste tomatoes--enough to put up and last us all winter and spring. Not this year! And last year I grew Thai Pink Egg tomatoes that did extremely well. The big, healthy plants were dripping with bright pink tomatoes. This year the plants are covered with fruits, but the actual plants are dead! Blister beetles and something else. Very disappointing. On the other hand, this is the first time I can remember getting such a good crop of Kellogg's Breakfast Tomatoes. Cluck cluck cluck cluck cluck cluck! Cluck! What happened to your Super Chicken status? Was that just a brief thing after The Great Escape & Rescue--or did Whitey demand that you stop making yourself sound better than her? She is older than you, you know. So I'm sure she'd claim she was wiser--and more super. Did she ever tell you about the entire winter she spent living al fresco? Susan-Sometimes we super hero(ine)s have to be discreet about our, er, powers. We have our alternate, farmyard identities and emerge in capes, when the occasion calls for it. Wouldn't want to be ostentatious, and, uh, ruffle anyone's feathers. Whitey is, of course, very impressive... for an ordinary chicken. I respect her deeply. Anyhow, she tends to peck me a bit if she thinks I'm being a show off. But holler if you need to be rescued or what have you. Apparently the neighbors with the chickenz have a "catch 'n release" policy. We watched the youngest out this morning with his big fish net catch a chicken. And then release it. Joe says he was practicing. Hmm.